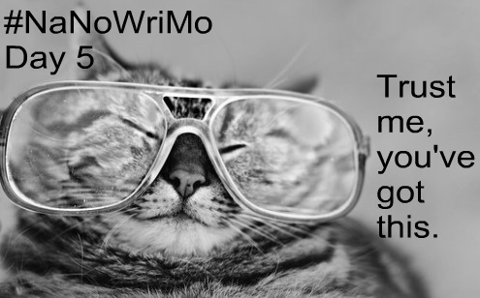 Today is day five and by midnight, the Wrimo who is able to keep the pace of 1667 words a day should be able to update her word count on the NaNo site 8335 words at the end of her writing day. I’m ahead with Potholes at 8893. If the story is flowing for me, if I have my mojo and my muse is on my shoulder giving me shivers and whispering tantalizing words in my ear, 1667 is like a get away weekend that goes way too fast. If those elements of my writing psyche are missing, 1667 words is like a long bad day at work. Well, not that bad. If all of those can be considered works in progress, I have a few. I saw this quote today supposedly by Phillip Roth: “The road to hell is paved with works in progress.” There is truth in that. I finished the rough draft for Lilyland Book 2, Places Bright and Dark, on Oct. 31, 90 minutes before the start of NaNoWriMo 2012. I added another scene last night and thought of a component to add to that. Lily and Charlie just won’t let me go! My goal for PBD is to have it published by June, 2013.